I listened to this book on Libravox. The reader did a great job, and I recommend the book to anybody who wants to read the father of Classical Economic's seminal work. By today's standards, this would definitely be considered a "dry read". 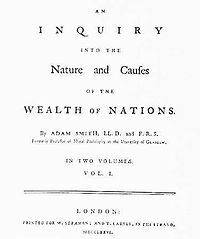 In this multi-volume work, Smith lays out the definitive argument against mercantilism, the prosperity of a nation is dependent upon its supply of capital to the world economy. This over-simplistic view gave way to classical economics, and the modern supply/demand method of looking at macroeconomics and microeconomics.